Cats are living longer and longer. This is due to better medical care and the fact that more cats are living only indoors. These cats commonly live up to 15 to 18 years of age with a few living into their twenties. The oldest cat on record lived to be 38 years old! 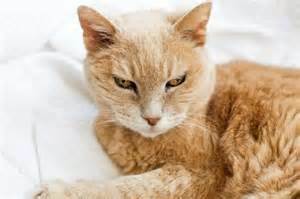 Hyperthyroidism usually occurs in cats older than eight years of age. The older the cat, the more likely the disease. A tumor (97% of the time it is benign) causes too much thyroid hormone to be produced. No one knows why this tumor forms. The tumor itself doesn't cause a problem, the symptoms are due to the excess hormones. Common symptoms are weight loss even though the cat is ravenous, chronic vomiting, soft stools, fast heart rate, and some develop a heart murmur. 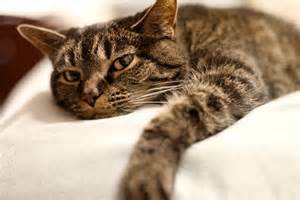 Further, cats can develop hypertension (high blood pressure) as a secondary problem due to the hyperthyroidism. There are several treatments for hyperthyroidism. 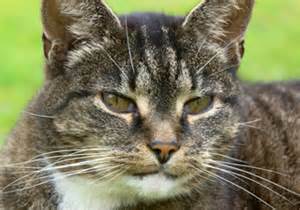 A special diet made by Hill's, Prescription Diet Y/D, has been found to be very successful, if your feline will eat it. This diet is extremely low in iodine, and it has to fed exclusively in order to work. Other treatments are the oral drug methimazole, surgery to remove the mass, or radioactive iodine. Surgery has fallen out of favor because often both sides of the thyroid gland are affected. Radioactive iodine has the advantage of being a one-time treatment (at least 97% of the time it is), but it is costly and needs to be done at a specialty clinic where the cat is hospitalized for a few days. There is an ironic phenomenon in which the disease of hyperthyroidism sometimes masks kidney disease. The kidney values may look fine until the veterinarian starts to treat the thyroid disease. If both diseases are present, the Y/D diet is good because it is also low in protein and phosphorus, which is the type of diet needed for renal disease. However, if Y/D is not an option, a veterinarian may try methimazole next. If the kidney values are still okay, even when the thyroid disease comes under control, then we know the cat is a candidate for radioactive iodine, if that is desired; or the cat can be continued on a full dose of methimazole. if the kidney values start to increase as the thyroid disease comes under control, then we know that we can't fully treat the hyperthyroidism, we just try to reach a balance between the two. Kidney disease is also very common. Symptoms are weight loss, vomiting, soft stools, and poor appetite. Hypertension, anemia,and excess phosphorus in the blood commonly occur as secondary problems. Blood and urine tests will determine how severe the disease is, and what level of treatment is needed. A diet made for renal disease can really lengthen the time before the signs get worse. A more severe case may require hospitalization with intravenous fluids. After the cat is stabilized, some veterinarians teach their clients how to give subcutaneous fluids at home to their cats. A few cat owners have even had kidney transplants performed for their beloved cats at teaching hospitals. This is a very expensive surgery and they are required to adopt the donor cat. Cats can get high blood pressure. In fact, hypertension is almost always due to kidney disease or hyperthyroidism in the feline. The veterinarian or staff member will measure the blood pressure with a cuff placed around a leg, then attached to a manometer similar to the method utilized in humans. Multiple measurements are usually taken of the systolic pressure (the higher one taken for people). It is important to monitor for hypertension in cats with renal disease or hyperthyroidism as it may appear early or late in either disease. If it is found, oral medication will be given to correct the problem. Cats are wonderful pets; however, they are very good at hiding symptoms of illness or discomfort. It is important to have an annual exam (twice yearly for cats older than 7 years of age) and laboratory tests to catch these diseases early when it is easier to treat them and get them under control.